Finding the right wedding venue for you should be tip top of your list of priorities in your wedding planning. But it can be hard work… There are so many amazing venues out there in different price points - how do you choose? The next instalment of my Wedding Planning 101 series is here to help you do just that; with my handy checklist of questions to ask your potential venues you’ll be well equipped to make this important wedmin decision. Watch the video, or read the highlights below to learn how to hunt down your ideal wedding venue, and what to ask them to get the most out of your venue visits. I’ve made a handy free checklist for you to download and take with you on your venue hunting trips, so you can print that out for each venue and compare notes. Sign up for that for free here. The first step to finding the right venue for you is to ask yourself some important questions. If you haven’t read part one of Wedding Planning 101 yet, Setting Your Wedding Priorities, or part two, Setting Your Wedding Budget, then I would highly suggest hopping over to read those first, because that will give you the best head start and really help you make this big decision. Location - where do you want to get married? What’s your budget? Part two of the series will help you with this. What style of wedding are you hoping to have? What atmosphere do you want to create? Complete the tasks in part three of the series on choosing your wedding theme to help you answer this question. It’s really important to visit your potential wedding venues and ask lots of questions. You can download my free venue checklist here, and print one off for each venue to make sure you don’t forget anything. Then you can compare your options side by side to make sure your wedding venue is ticking the right boxes for you. LOGISTICS. What’s included in your venue hire cost? Different venues have different packages, so it’s important to check which of these things are included in your hire cost, and what needs to be hired in separately. Glassware: wine glasses, champagne toast, reception drinks. Staff: Bar staff, venue coordinator, clean up team, waiting staff. In house suppliers: Caterers, florist, venue dressing… etc. Photo by Rebecca Emily Photography. Fire regulations - do they have any restrictions on candles or open flame? For example, if you’ve got your heart set on a bonfire in the evening then you’ll need to check this is possible. Alcohol - some venues will allow you to bring your own alcohol in and some won’t, and some may charge corkage per bottle. Confetti - are you allowed to use it? Does it need to be biodegradable? Are they licensed for marriages? Or will you need to have a legal ceremony before to sign the papers? DOES IT FIT YOUR AESTHETIC? Go back to the exercise in part three of the series where you chose your wedding theme, and ask yourself if this venue fits within the type of wedding you want to have. Does it help you create the right mood and atmosphere, or would you be fighting against it? Lighting - do they have nice atmospheric lighting for the evening, or is this something you need to hire in? Does the decor fit your chosen style? Think about a wet weather plan. If you have your heart set on an outdoor ceremony, make sure there is a rainy day option that you like the look of just as much. What’s your gut feeling when you walk in to the space. Does it feel like “you”? 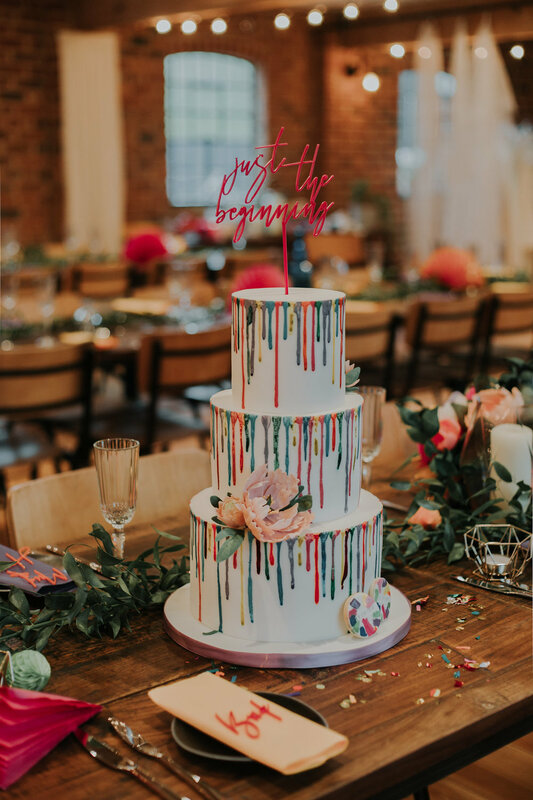 Photo by Rebecca Emily Photography, Cake by Knot & Bird. Accommodation options: does the venue have places for your guests to stay, or is it near to convenient accommodation options if not? Transport - is there enough parking at the venue, or will you need to organise additional transport to get your guests there? Flow between rooms. Where do your guests wait while they’re waiting to sit down for dinner? Photo opportunities - including an option if it’s raining. Once you’ve found a venue that you’re really interested in, I would definitely recommend visiting more than once, and try to go at different times of the day. Visit in the evening to see what the atmosphere is like when the sun goes down, try and visit when the weather isn’t so good to see what their wet weather options are like. This will help you prepare for every eventuality, and make sure you’re making a totally informed decision. I hope this helps you on your venue search - don’t forget to download your free wedding venue checklist to help you compare your choices, you can sign up for instant access to that below.